Eleonora received her master’s degree in psychology in 2008. She began studying Applied Behavior Analysis (ABA) and earned her BCBA credentials in 2012. 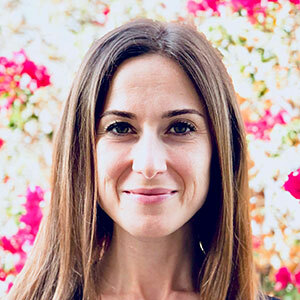 Instrumental in the development and growth of the Palm Desert office in 2009, under the mentorship of Dr. Sadeghi and Stephanie London, Eleonora now leads her team as director of clinical services. Originally from Italy, Eleonora lived in Puerto Rico for 10 years. She now lives in Palm Desert with her chef husband and three daughters. She can always be found with her kids engaged in fun activities like crafting, enjoying the outdoors, and baking. She takes great pleasure in watching her talented drummer daughter perform with her band, and she loves yoga and traveling to new places with her family.